Well presented and well proportion detached family house in the pleasant village of Littlethorpe. The accommodation comprises entrance hall, lounge, kitchen diner, utility room, play room/office, downstairs w.c., four bedrooms, all with built in wardrobes, en-suite to master, family bathroom, rear garden, off road parking and garage. This property offers excellent value for money and is a real must see so call Phillips George on 01162168178 to book your viewing today! SUMMARY Well presented and well proportion detached family house in the pleasant village of Littlethorpe. 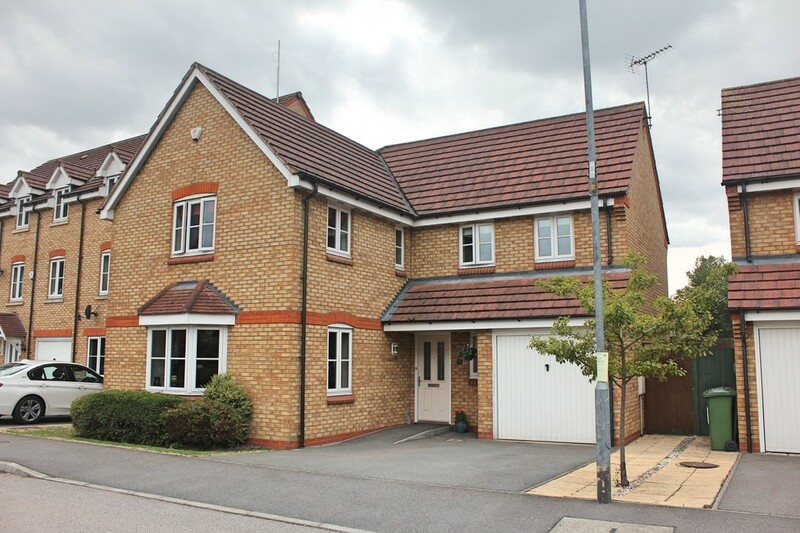 The accommodation comprises entrance hall, lounge, kitchen diner, utility room, paly room/office, downstairs w.c., four bedrooms, all with built in wardrobes, en-suite to master, family bathroom, rear garden, off road parking and garage. This property offers excellent value for money and is a real must see so call Phillips George on 01162168178 to book your viewing today! ENTRANCE HALL With Oak floor, under stairs storage cupboard, radiator and stairs off to the first floor. LOUNGE 15′ 8" x 13′ 2" plus bay (4.78m x 4.01m) Having electric fire and fireplace, bay window to the front elevation, radiator and window to the side elevation. KITCHEN/DINER 24′ 1" x 10′ 11" (7.34m x 3.33m) Comprising base and wall mounted units with complementary work surfaces, sink unit with drainer, built in oven, grill, gas hob and extractor hood, tiled splash backs, built in dishwasher, tiled floor, spotlights, French doors to the rear garden, door to the rear, window to the rear elevation, t.v. point and two radiators. UTILITY ROOM 6′ 10" x 5′ 4" (2.08m x 1.63m) Having base and wall mounted units with complementary work surfaces, sink and drainer, plumbing for washing machine, vent for tumble dryer, tiled splash backs, spotlights, tiled floor, radiator and window to the side elevation. 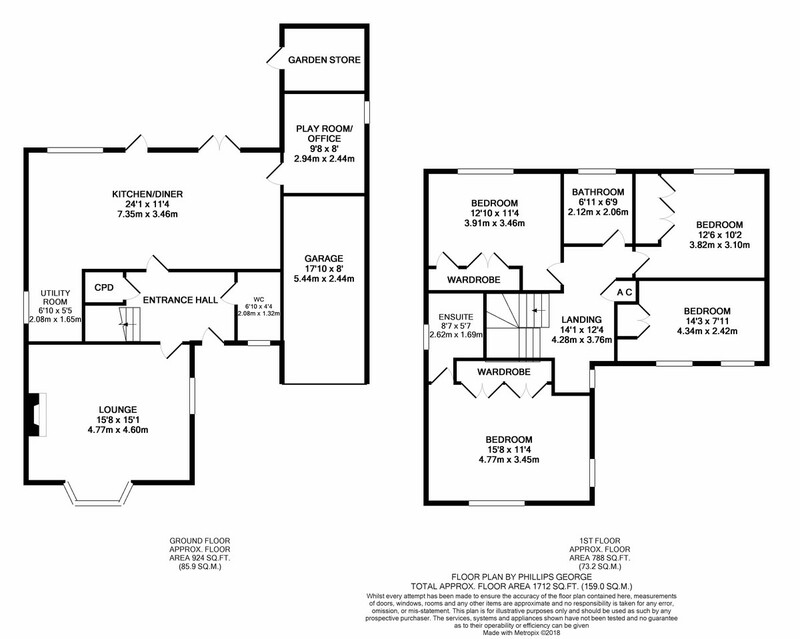 PLAY ROOM/OFFICE 9′ 6" x 8′ (2.9m x 2.44m) With laminate floor, spotlights, cupboard housing the boiler, window to the side elevation and radiator. WC Comprising low flush w.c., pedestal wash hand basin, tiled splash backs, spotlights, window to the front elevation and radiator. LANDING With airing cupboard, access to the loft, spotlights, window to the side elevation and radiator. MASTER BEDROOM 15′ 8" x 13′ 8" max (4.78m x 4.17m) Having built in wardrobes, windows to the front and side elevations and radiator. ENSUITE Comprising shower cubicle, pedestal wash hand basin, low flush w.c., shaver point, tiled splash backs, spotlights, radiator and widow to the side elevation. BEDROOM 14′ 4" max x 6′ 10" max (4.37m x 2.08m) With built in wardrobes, two windows to the front elevation and radiator. BEDROOM 12′ 10" max x 11′ 4" max (3.91m x 3.45m) Having built in wardrobes, two windows to the rear elevation and radiator. BEDROOM 12′ 3" max x 10′ 2" max (3.73m x 3.1m) With built in wardrobes, window to the rear elevation and radiator. BATHROOM 6′ 9" x 6′ 8" (2.06m x 2.03m) Comprising panelled bath, pedestal wash hand basin, low flush w.c., tiled splash backs, heated towel rail, spotlights and window to the rear elevation. OUTSIDE The front of the property is paved to provide ample off road parking. The garage has an up and over door. The rear garden is mainly laid to lawn with flower borders and shrubs, patio area, outside tap, light and power socket, decked area, gated side access and a fenced surround.